Below is a scottish missionary record of their meeting with Ngoni elders and eventually with the Paramount Chief of the Maseko Ngoni then, Chikuse. Apparently the missionaries had been trying to meet Chikuse but to no avail. They believed that he had a superstitous fear of the white man. I however think that there could have been other reasons why Chikuse did not want to meet them. In any case he might have seen them as opponents in the battle for control in his sphere of influence. Into the slow, sullen movement of village existence came another agony, the swift, arrow-like Ngoni raid—a savage war-chant in the night, blazing huts, spear-thrusts, frenzied slaughter, and a rapid ebb of naked warriors laden with maize, cattle, and goats, and every boy and girl they could lay hands upon. This was the second problem. Bad as it seemed to be, it was an evil with which the Doctor thought he could cope: it meant a policy of conciliation, of the establishment of strategic positions along the Lake coast, then a cautious and peaceful penetration into the highlands behind. The first step was to come into touch with these wild hill-folk, and he was planning an early visit when one day to his astonishment a Ngoni minor chief or headman and his followers appeared at the Station. They had heard of the wonders of the place and had ventured down on a friendly visit. Realizing the importance of the occasion the Doctor laid himself out to please and attract them. He was greatly taken with their fine physical development, their manly and independent bearing, and their courtesy. Of their history he already knew something,but it was from them that he gathered the first definite details of their tribal movements. The Ngoni were strangers in Central Africa, of Zulu origin, part of that great stream of migrants whichwas set in motion by the colossal operations of Chaka, whose career of wholesale massacre shook Southern Africa to its foundations in the beginning of the nineteenth century. Crossing the Zambezi,various divisions traversed Central Africa as far north as Lake Tanganyika, plundering and murdering, with intervals of settlement,during which they subjugated the weaker tribes around them and incorporated the young men into their fighting regiments. They finally occupied the ranges of hills on the east and west sides ofLake Nyasa, those on the east becoming the intractable Mangwangwara,those on the west the fierce Ngoni under Chikusi in the south and Mombera in the north. It was these foreign soldiers of fortune whom, under the names of Mavite and Mazitu, David Livingstone encountered so often during his travels in the Nyasa region. He was impressed by their qualities and their opposition to the tactics of the Arab slavers—for they did not to any extent engage in the foreign traffic—and believed they could be made the best allies of the British. The visitors, who were followers of Chikusi, still spoke with the Zulu click, though some of the younger men used Chinyanja. 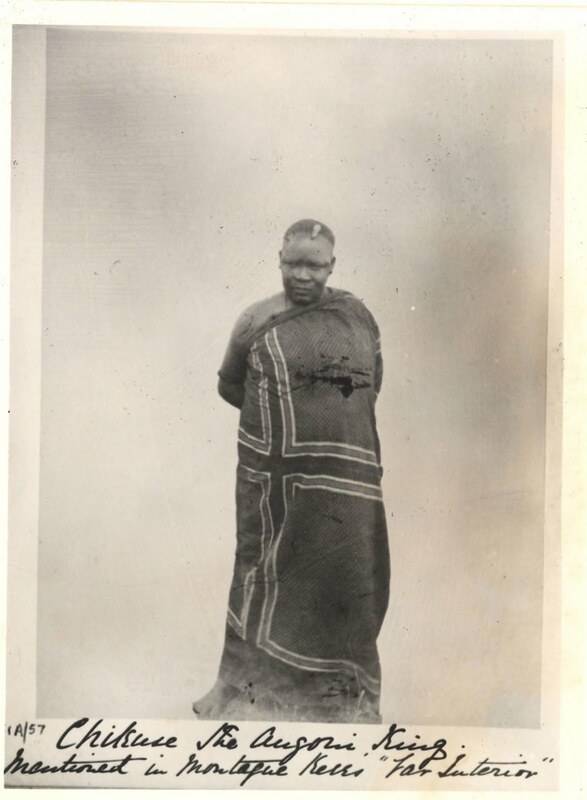 William Koyi, the Lovedale native, was called, and conversed freely with them in the Zulu tongue. The Doctor instantly grasped the enormous importance of this fact. Koyi in his eyes became thence forward one of the most valuable members of the staff; he wouldbe able to take up work at once amongst the hillmen, and other Lovedale workers would follow. He was overjoyed at the prospect opening up, and asked the headman if he would receive a teacher. The reply was a warm invitation to come up and settle amongst them. The Doctor saw, however, that such men would be more difficult to instruct and train than the softer and weaker tribes in the plains, but once " cut and polished " they would, like his own Aberdeen granite, stand the weathering of both sunshine and storm. He conducted them round the Station. With the dispensary and the rows of medicine bottles they were deeply impressed. In view of their bloodthirsty reputation the Doctor thought it well to show them a rifle and revolver, and how they were discharged,and were able to hit a small object at a distance. They, however, denied that many of the exploits of which he had heard were thework of the pure Ngoni. These had their regular campaigns, as they had always had, to exact food-tribute from conquered peoples with richer land, but many of the isolated raids and murders, they contended, were committed by lawless bands, the scum of the tribes whom they had absorbed. Without expressing any opinion on the point the Doctor noted this explanation to guide him in the future. He told them of the desire of the English to live at peace in the land, of their hatred of slavery, and of the Divine law that all should do to others as they would have others do to them; entertained them royally on the best resources of the Station, and supplied them with shirts,blankets, beads, snuff-boxes, and plants of various kinds for their gardens in the hills. The Doctor's first objective was the headquarters of Chikusi,the Chief of Southern Ngoniland, amongst those western mountains which he had so often regarded with interest from his retreat on the hillside. Leaving Cape Maclear on 12th August 1879, a landing was effected that night on the coast, 15 miles to the southwest of Livingstonia. All next day the party marched across a hot, parched, and deserted plain, the baked blue clay soil of which was imprinted with multitudinous tracks of elephants and hippos. Towards the low foot-hills the land became more fertile, and supported a large population of the original Nyanja, who had become subjects of the Ngoni and aped their manners and customs. As they passed into the hill country the native track grew steeper until it became a stair, and then a ladder, and they had to climb up with the aid of tree roots and rocks. Emerging from the haze and oppressive heat they entered a clear bracing atmosphere, where at night they suffered from cold. As Ngoni with shields and spears crossed their path, indicating the proximity of villages, the tents were pitched side by side and the fires of the carriers made up a few yards away, whilst guards of men with rifles and fixed bayonets kept watch throughout the night. Continuing over a desolate country they saw, at an altitude of 5000 feet, a magnificent panorama of scenery ; to the north and west the undulating tableland of Ngoniland, broken by granitic peaks, spread as far as the eye could see, and on the east and stretching north and south was the shining sheet of Nyasa with its bordering plains ; southwards was the promontory of Cape Maclear; with the Mission Station and beautiful bay easily discernible ; and, beyond, the massive peaks of the Shire Highlands. Amazed at the temerity of the strangers, and afraid to take the responsibility of helping them, the people they came across refused to supply guides, but the village of the Chief was ultimately found, situated in open country with a view all round of from 15 to 20 miles. The land, which was 4700 feet above sea-level, had been denuded of its trees, and the soil seemed poor, but there was abundance of cattle. The population, estimated by the Doctor at about 20,000, was wild in the extreme ; all the men carried clubs, spears, and shields. For dress they wore only a bunch of feathers or a small skin, with rings of hide on their legs and arms. The younger, lithe and active, moved about in the clear cool air with the spring and agility of cats. As for the women, their sole attire consisted of a piece of bark cloth, some having also a sheep or goat skin thrown over their shoulders. Two men were sent forward to the Chief to ask for a campingplace. No response being made, and the darkness falling, the party entered the village, a circle of wretched huts, and rested beside the cattle kraal, the carriers huddling together in silence with strained, alert faces. The air was charged with tension and terror. Chikusi refused to appear, but had a surreptitious look at the visitors. One of his councillors at last came forward, and Fred spoke to him, but was not understood. Koyi then tried him with Zulu, and his face lighted up with interest. He was then informed that the white man had come in peace. They were shown a spot on which to pitch their tents, and the two leaders were glad to take refuge from the cold beneath their blankets. The thermometer registered 44 Fah. during the night. Next day the Chief was still afraid, and would not appear. Palavers went on with the councillors, all old, grey-haired men, with keen, intelligent, and resolute faces, who would not believe that the visitors had come in a friendly spirit.
" Show your goodwill," they said, " by sending a gift to the Chief." " It is our English custom," was the reply, " to give the present to the Chief himself." " You want to bewitch him ! You must go away and take all your evil spirits with you." Koyi endeavoured to explain their mission. " We welcome you as one of ourselves," they said, " but you are their slave, or else why are you with them ?" He told them the story of his life, of his wild boyhood, his stay at Lovedale, and his object in coming to Nyasa. So deeply interested were they that he had to repeat the narrative over and over again. He told the Doctor that these men were able to use all the Zulu clicks. It was probably the talk about Koyi that brought out the mother of Chikusi ; she was accompanied by his sister, a woman of light colour with bright, intelligent face, and adorned with brass rings and bracelets of wire. They were each given a dress. Koyi found favour in their eyes, and they wished him to settle with the tribe. Whilst this talk was going on a message arrived that the visitors were to shift their tent to a hollow outside the village in the direction opposite to the route by which they proposed leaving. This looked suspicious, and they sat tight.
" Why did you not move ? " they were asked next morning.
" Why did you ask us to move ? " countered Koyi. " It did not show a friendly spirit." " It is you who are not friendly ; you have a double purpose in coming here." " I am willing," replied Koyi, " to stand in the white man's place, and if anything wrong happens you can cut off my head." Still they were not satisfied ; behind the scenes a secret ceremony was taking place. To test whether there was any evil object in the visit the ordeal of poison was administered to a man. He vomited the mixture, which was, so far, satisfactory ; it was next administered to a dog, which also rejected it ; and then to a fowl,which did the same. There was peace, therefore, in the hearts of the white men. In a sense this weird African rite influenced the future of Ngoniland. Large parties of anned men had been quietly gathering in the village, and had the verdict been different the party, it was believed, would have been massacred and the Livingstonia Mission wiped out of existence. At last came the intimation that the Chief would be satisfied if the customary gift was sent, and Koyi advising compliance, the Doctor agreed. One of the headmen was appointed Chief for the moment, and some calico, shirts, beads, knives, trinkets, and other articles to the value of £4 were handed over to him. In this odd fashion the compact of friendship was sealed. That night the Doctor noticed lights moving about some of the distant villages ; on asking the meaning of it, he was told that the people were out with torches hunting rats and mice to eat with their porridge. On Sunday the Doctor worked at his translation of Mark's Gospel, and in the evening gathered as many of the people as he could round the camp fire and told them the story of the Prodigal Son. One headman was much impressed by the recital, and expressed his approval of the father's attitude of love and forgiveness by snapping his fingers and an occasional " yebo " of assent. Next day came the State visit. Chikusi, a tall, excessively corpulent, sensual-looking man, with a perfectly emotionless face,took his place on an ant-hill ; he wore a blue robe thrown loosely about him ; round his ankles were some brass rings, and he carried a staff. The white men were directed to sit on stools some distance away, and the councillors ranged themselves closely round the Chief in order to intercept any evil influence that might emanate from them. Not a word came from Chikusi ; speaking was left to one of the headmen.
" We have come," said the Doctor, " on a friendly visit. We are all the children of the same Father. We are white, but we are men like you ; if we cut ourselves we bleed ; if we walk we get tired and need rest ; if we hunger we have to eat. God is our Father-yours and ours. From Him we bring a Book with a message to all His people. He desires all to live at peace with each other. We are men of the Book, have been living on the Lake for years, and have made friends with many Chiefs. We teach children to read the Book and obey God's law ; to work in wood, and to know about the arts of civilized life." " We are glad you have come," the headman gravely replied.
" We welcome you as messengers from the Father of whom we know little. We have only one question to ask : will any evil,any sickness or death, come to our village on account of your visit, and will you, when you go, take away all your spirits with you, not leaving even one to plague us afterwards ?" " Sickness and death," said the Doctor, " were in your village before we came, and there will be none because of our being here. The only medicine I use is in the treatment and cure of bodily ills." " We are satisfied. You are greater than we. You are our fathers and we are your children." Suddenly Chikusi rose and walked off, followed by a singularly lugubrious groan of respect from the assembled crowd. The councillors then pressed the visitors to remain another night that the Chief might have a good sleep after having seen them. Later a messenger came from Chikusi.
" The Chief wants the white man's Bible." "He is told that it contains the secret which has made the English great." " Tell him he cannot learn the secret from the Book unless he can read it." The Doctor suspected that he would use it as a charm, and decided not to leave him one.
" Tell him also that in order that he may sleep sound to-night we shall stay until to-morrow." While the negotiations had been going on Mlolo was conducting a search for his slave daughter, and to his joy discovered her in a neighbouring village. Her captor, however, refused to give her up. The Doctor therefore approached the Chief's mother, obtained her sympathy and help, and at sunrise on the day of departure a man was sent with Koyi and Mlolo to the village to arrange for the redemption of the girl. After some trouble a ransom was accepted,and at noon she was brought to Chikusi's, where the party were waiting impatiently in marching order. The girl, who was only seventeen, was about to become a mother, and the Doctor slackened the pace and proceeded by easy stages, and latterly made up a hammock for her conveyance. On the journey south a minute inspection of the west coast was made and friendly relations cemented with the Chiefs. They all complained of the Ngoni who raided them unceasingly and carried off their cattle and grain, and they asked for war medicine to make their people strong and brave in battle. The Doctor disclaimed possessing any potion to impart courage that lay in a brave heart. 'We will give you cattle and ivory for it,' the Chiefs persisted. 'But we really haven't any' Nothing would convince them. 'You do not want to part with it,' they said reproachfully. One old Chief thought he would put the matter to the test. He asked the Doctors to meet him secretly outside a village at the dead of night, and when they came pointed to a young bull, tethered to a tree, and a tusk of ivory on the ground. 'I will give you those for your war medicine,' he said. Some Ngoni who had forsaken their tribe were discovered, and Dr. Laws asked Koyi to talk with them. They understood him at once. Procuring his New Testament he read the story of the Prodigal Son. The Doctor watched their faces, and saw that they took in the meaning. Koyi spoke of his, and their, old country, and told them how he had been with the English and had learned to love God and read His Book, and was now on the Lake as one of His teachers. They were deeply interested, and said they would endeavour to spread the news to the hills. The Doctor was more than ever convinced of the possibility of evangelizing these people by natives who knew their language.